Always a fan of fairy tales, I love to read new renditions just to see what the authors will do with them. Granted almost all the fairy tales that our children have come to know and love, and likely ourselves as wee ones as well, are in and of themselves retellings. Anyone who has read the original Grimm tales knows they are far darker than anything we actually pass along to our kiddos. However, I digress. Back to Falling for Rapunzel. This is a book we actually checked out from our local library a couple of months ago, but my 5 year old liked it so much she ended up checking it out from her school library again just the other day. 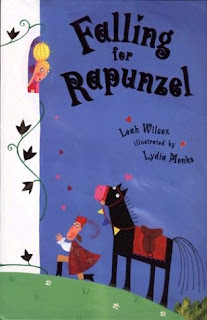 Falling for Rapunzel is, as the name suggests, a retelling of the original Rapunzel fairy tale. Though, unlike its classic counterpart, Wilcox's version is simply uproarious. The Prince tries countless times to get Rapunzel to understand his request, but he eventually gives up after she tosses out her maid in lieu of her braid. For the Prince and the maid, it's love at first sight. And truly, the Prince is exasperated with Rapunzel anyways. So, the maid and the Prince take off together, leaving Rapunzel and her bad hair behind. What a clever, off the wall story. I can see why my daughter loves it so much. Combine the witty, rhyming text with the colorful and jocular illustrations (by illustrator Lydia Monks), and you have both a visually and mentally engaging tale. When I picked this book up off the library shelf I didn't immediately realize it was written by the same author as Falling for Rapunzel. As it turns out, it was actually only after we got home and I started to really look at the artwork that I sensed a familiarity I couldn't quite place. Just as I was about to pull the connection out of my head, I happened to flip to the back cover where there was a picture of Wilcox's previous book. If only I'd have realized there was a sequel, or rather yet another fractured fairy tale from Wilcox, I'd have looked for this one sooner. As I've said before, I've always been fond of checking out the retellings of popular fairy tales. 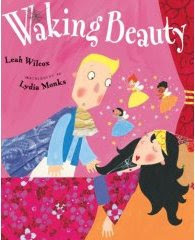 And this take on Sleeping Beauty is nothing short of comical, entertaining, and truly original. While out on a dragon hunt, Prince Charming hears a horrible dragon roaring from within Sleeping Beauty's castle. He rushes in to bag his beast, only to discover the roar was not that of a dragon but the snore of Beauty fast asleep. The three good faeries are there watching over her, and they are thrilled to see that a prince has finally, after 100 years, arrived to break Beauty's sleeping spell. However, as readers will quickly find out, Prince Charming isn't exactly charming. Nor is he very bright. But then, if he was, this story wouldn't be nearly as funny. Instead of kissing the fair maiden, the Prince determines he must try a number of other things first. He shouts, jumps on the bed, dumps water on the sleeping Princess, and even shoots her out of the castle from a canon! Alas, Beauty doesn't not wake up. And as the faeries have tried to tell the stubborn Prince, there is only one way that he can wake her- with a kiss. Finally the Prince relents and listens to what the faeries have been trying to tell him. Once he does, he is able to eventually wake Sleeping Beauty from her century long nap. Yet, there's one more surprise in store for the Prince. I won't tell you what though because I need leave some element of surprise for you should you decide to pick this one up to read to your kiddo(s).